In case you missed it, a couple of weeks ago, Statistics Canada published their analytical finds relating to Canada's linguistic diversity, information obtained from the 2011 Census (see StatsCan document "Linguistic Characteristics of Canadians" ). In these finds, what is the least surprising is the usual national obsession of surveying the two official languages, English and French, and to explore in great detail the linguistic duality in Canadian society with all the statistical breakdowns respectively given for each province and "census metropolitan area" (CMA). Very interesting, however, what seems to have captured the interest of most people is that outside the usual discussions that pertain to English and French as they are spoken - or not - in the mouths of Canadians; it is rather the use of what StatsCan terms as the "top immigrant languages" that have garnished the most attention. At home, here in the National Capital Region, in the Ottawa - Gatineau CMA ("census metropolitan area"), it is Arabic and Spanish that revealed themselves to be the most frequently reported immigrant home languages. Among the nearly 141,000 persons in Ottawa -Gatineau that StatsCan reported speaking an immigrant language often at home, the vast majority of this population (87%) lives on the Ontario side of the CMA and with the remaining 13% living on the Quebec side. Arabic came out first as the number one immigrant language spoken in Ottawa and Gatineau, while trailing in second and third places in Ottawa were Chinese and Spanish; while on the Quebec side Arabic was followed by Spanish, Portuguese and Chinese. In a nutshell, these were the stats reported for our hometown. Elsewhere in Canada, however, the picture painted by the StatsCan finds was indeed quite different. Moreover, it seems that - quite interestingly - the finds were somewhat headline grabbers and in many ways contributed to the ongoing re-evaluation process and cultural re-appraisal of what it means to be Canadian - and what languages that as Canadians we speak. For the most part, perhaps for those older Canadians who who were around when the terms "francophone" and "anglophone" were first introduced by the Royal Commission on Bilingualism and Biculturalism back in the 1960s; maybe for these individuals, the Tagalog and Punjabi languages are not as familiar by name as some others. 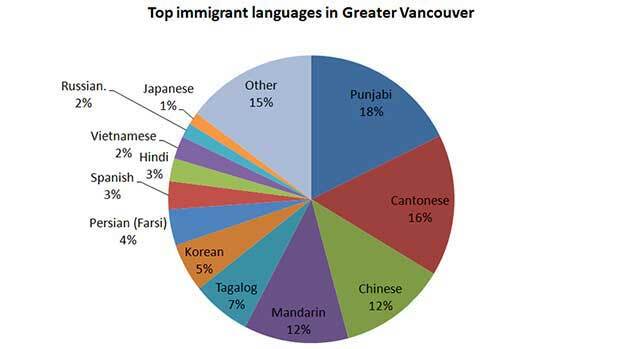 Although, clearly for the Greater Vancouver area, this is clearly not the case, for Punjabi speakers - along with Chinese languages (Cantonese, Mandarin, or any other unspecified Chinese language) - according to StatsCan, are the "top immigrant languages" spoken at home (see CBC article "Punjabi and Chinese top immigrant languages in Vancouver" Oct. 24, 2012). See figure below for the statistical breakdown. Back in the 1960s, the Royal Commission on Bilingualism and Biculturalism introduced two new words into Canadians’ vocabularies: anglophone and francophone. As a direct consequence of this growing change in the linguistic and cultural makeup that is now apparent in Canadian society, the Montreal Gazette's Marian Scott reports that - because of this new reality - Quebec's Conseil superieur de la langue francaise has introduced some new terms, "francotrope" in order "to describe immigrants whose language is closer to French", and "anglotrope" in relation to those "who tend toward English" (M. Scott "Census 2011: StatsCan does away with ‘francophone,’ ‘anglophone’ and ‘allophone’ " Oct. 26, 2012). One might feel tempted to snicker upon first hearing these new terms, but alas, let us be reminded that the neologisms "francophone" and "anglophone" were likely just as silly-sounding to those people who first heard back in the 1960s when they first appeared. So, I guess we'll have to wait and see if "francotrope" and "anglotrope" will also eventually catch on, and somehow roll off our tongues just as naturally in our daily conversations as do "francophone" and "anglophone", and they might even occupy a space somewhere on government forms - as two more optional boxes to check off. The main reason for this article is not simply to discuss the StatsCan finds, but rather it is also more specifically intended to explore how it is that these types of language classifications shape our reality, or our social fabric. For instance, as Marion Scott discusses in her article, if we look back to the 19th century, we can see that census-takers didn't even ask questions about language (M. Scott "Census 2011: StatsCan does away with ‘francophone,’ ‘anglophone’ and ‘allophone’ " Oct. 26, 2012). "At that time," Scott writes, "Canadians were listed in the Census by national origins, such as Irish, English, Scottish or French-Canadian." Simply put, this was sufficient information in telling you what language a person spoke - which was assumed to be the dominant language of the place of origin, even if it was not always the case. Certainly, Canadian society has grown steadily more and more diverse since the days where census-takers would basically find it sufficient to ask for the country of origin in making their assumptions. Although, in addition to this, more importantly is the fact that since the 19th century, there has been another drastically important change that has occurred: The typological classification of languages, or if you prefer, the birth of historical linguistics. This first occurred in the course of the late 18th and early 19th century, when brilliant scholars such as the Schlegel brothers, German Romantics, first developed a classification system in regards to Indo-European languages. And, later on, in the early part of the 20th century, there was the Swiss linguist Ferdinand de Saussure, whose scholarship contributed in laying down the very foundations of modern linguistics, and in consequence, to drastically change not only our understanding of languages, but even our perception of the world. In many ways, without a proper classification system, in the past one could simply have called "Indian" (or Hindi) whatever language that might have hailed from India, despite the fact that it could have been Punjabi, Tamil, Marathi, or Kannada. “They have come to shape the way we see reality,” said Jean-Pierre Corbeil, chief specialist of language statistics at Statistics Canada. But if you looked back to the 19th century, you would see that census-takers didn’t even ask questions about language. At that time, Canadians were listed in the Census by national origins, such as Irish, English, Scottish or French-Canadian. In those days, that information was considered sufficient to tell you what language a person spoke. But as society has become increasingly diverse, the vocabulary has evolved. Seemingly, we cannot unlearn what scholars such as these have taught us. In many ways, it is taken for granted that we acknowledge that languages are often attached to specific cultural or religious groups (i.e. Arabic with Muslims, Hebrew with Jews, Punjabi with Sikhs, Hindi with Hindus), and that each ultimately comes from a specific geo-cultural location - a place or origin. But, this very basic understanding of languages and cultural groups, though - as reflected in StatsCan questionnaires - make the all-important distinction that spoken languages are not always synonymous with a "national" identity or country of origin. This social consciousness of the complexity of human societies is inherently present in the questions asked by contemporary census-takers, and this system of classification - and the choices presented therein - as it is imposed on Canadians to check off in so many boxes in Census questionnaires, could be said to be a direct outcome of the classification system for languages that were developed by early linguists. The questions that therefore beg to be answered are the following: Is the current classification system in the Census forcing us to personally identify or chose a cultural/religious identity that is not really our own, but merely the closest one to chose from on the "check list"? In a multicultural society such as Canada, why and how could an individual identify one language over another when several "mother tongues" are spoken? Can one individual living in a multicultural and pluralistic society possess several "mother tongues"? These questions are the few that come to mind, but evidently there are many others. The one that most preoccupies me is the "pigeonholing" effect - for lack of a better metaphor - of classification systems altogether. Is the main purpose of the Census to serve as a governmental tool used to "curb" culture, meaning to sway it and gear it to better assimilate and integrate those cultural/linguistic elements deemed as foreign into mainstream society? The media - and oftentimes it appears that Canadians in general - seemingly like to pick on Quebec in terms of language policing, but one could certainly wonder what purposes the language data of the Census serves in other Canadian provinces, even if there are no language watchdogs policing the city signs for letter sizes, translations and spelling.